2. In large mixing bowl, mix sugar, butter, vanilla, salt and egg. Stir in flour and baking soda. 3. Equally divide into two parts, place into two separate bowls. 4. Add 24 drops of red food coloring to first bowl and 24 drops of blue food coloring to the second bowl. Stir each bowl thoroughly. 5. Drop a well-rounded tablespoon of cookie dough on non-stick cookie sheet every 2 inches apart, equaling a dozen cookies per sheet. 6. Bake for 7 minutes for soft and chewy cookies. Cool. 7. 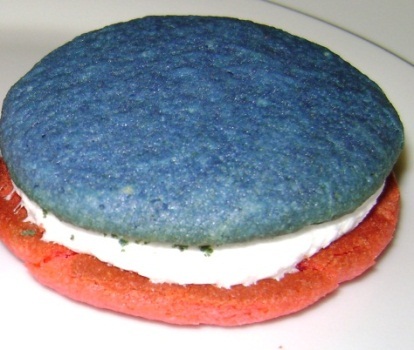 Place 1 red cookie on serving plate, 1 tablespoon marshmallow crème on red cookie, top with blue cookie. 8. Repeat until remaining cookies are used. Copyright, Kimberly Hodgkins. Simple theme. Theme images by Synergee. Powered by Blogger.